The Punchboard Media Big List is an ongoing series highlighting some of the many board, card, and tabletop games that the contributors at Punchboard Media feel are important enough that everyone should experience playing, with some insights into each title from various contributors as to why they are notable. Eric Buscemi (The Cardboard Hoard): Blood Rage is the second in designer Eric Lang’s iterative designs that started with Chaos in the Old World, and continued on with Rising Sun, all of which highlight some of Lang’s best design work. Blood Rage in particular is a favorite of mine -- despite my not being a huge fan of games with tons of miniatures -- because of its interesting hybrid gameplay that mixes the attributes of a smooth playing Euro game, such as the card drafting, area control, player board management, and diceless board confrontation, with the highly thematic Viking aesthetic woven throughout the game’s fabric in a way that does not feel superfluous or tacked on. This is the rare game, in my opinion, that had tons of buzz behind it and actually managed to live up to its stratospheric level of acclaim. Jamie Maltman (WDYPTW): Blood Rage manages to blend Euro card drafting and resource management with amazing minis and a battling Viking theme into a true masterpiece of hybrid game design. It's accessible and fun from a first play, with all those giant monsters to draft into your army, and exciting combos to explore as you battle your fellow players, but there are also layers of depth as you spot the potential for powerful combos for yourself or that you'll need to deny other players from collecting. All of this in a beautiful package and very reasonable play length. It's widely loved for a reason - while many area control games--and Lang's other designs--focus on a much more specific niche of gamers, Blood Rage offers something for most gamers to enjoy, and a large group have fallen in love with the game. BJ Rozas (Board Game Gumbo): Star Wars: Rebellion is a huge, cinematic team v team game from Fantasy Flight Games that puts gamers directly into the Star Wars trilogy (well, episodes IV-VI at least). Players take on either the Imperial or Rebel side -- the Imperials are trying to locate the rebel base and destroy any hope of rebellion, while the rebels win if they outlast the imperial assault (there’s a tracker on the board that advances toward the goal). I have only played once, with my buddies Dustin and Phil, on an epic all day Saturday Star Wars feast. But wow, that one play still sticks in my mind even a year or two later! I do not play big cinematic games much -- job, family, etc -- but my play of Rebellion stands out. First, the game was easier to learn than I thought. Players take turns assigning the famous characters from the movies on various missions, moving the gorgeously produced minis across the humongous board, and engage in daring rescues and all out battle across the star systems, and the entire system is easy to learn. Second, playing as partners with a friend who loves the Star Wars universe was awesome, even though we lost to the dreaded Imperials. (Han Solo let us down.) Finally, although each game veers wildly away from the actual movies, the events that happen that correspond to the movies create warm and fuzzy feelings, plus you get the added bonus of doing things differently yet still within a familiar landscape. I guess if I had to choose between BSG and Rebellion...I’d go with BSG only because of the player count and group dynamic. But, out of all of the big games that we play in the Gumbo (BSG, TI4, Game of Thrones, etc.) Star Wars: Rebellion is the only one I’d like to own for myself. Jamie Maltman (WDYPTW): Fantasy Flight has come up with 3 major flavours of Star Wars in a Box: X-Wing for individual dogfights, Imperial Assault for the adventures of a group of heroes, and Star Wars: Rebellion for the full political and military conflict across the galaxy. It's my favourite of the bunch. It has all the trappings of a big epic thematic game: a giant box of detailed toy-like minis of Star Destroyers, Death Stars, X-Wings, Y-Wings, AT-ATs and Snowspeeders and the rest, and a sprawling map of the galaxy with all the planets you know. But there's so much more depth hiding behind that. Standees for your starting group of heroes like Leia and Mon Mothma, or the Emperor, Grand Moff Tarkin and Vader are actually workers you'll be placing out each round. For the first few turns each player will draw a choice of new heroes like Luke, Han, Boba Fett and more with strengths and weakness in the various skill icons and space or land battles. You use them to move troops, fight battles in space and on planets, to attempt or foil missions on all fronts from diplomatic missions to activate production of more troops for your side, sabotage and spying, Imperial construction projects, capturing Rebels or daring rescues. You'll be rolling lots of custom dice for successes or to block your opponent, and to get hits or heal your troops in battle. All in service of the Imperial forces trying to find the elusive Rebel Base, while the heroes try to score points by completing strategic strikes required by their objective cards to move their tracker from the end of the round track to meet the current round number. Every decision is tense - is Chewbacca leading a Wookiee rebellion to hit an objective, or to draw the Empire's attention away from a base on far away Dagobah? Does Wedge's Rebel Squadron have the Death Star Plans, or is it a desperate attempt to pin your forces so the rest of the fleet can escape. Every game gives you the chance to tell a fresh new version of the original trilogy with different heroes, missions and focus systems depending on how it plays out. I've loved every play of this game, and the expansion dials the cinematic combat up to 10, both streamlining it and making it more fun and cinematic. Joe Sallen (The Good, The Board, and The Ugly and The Long View): Gloomhaven has taken the hobby by storm. It’s an accessible, deep board game themed around role playing games. It deserves the descriptor “D&D in a box.” There is 22 lbs of content, much of which is unlocked throughout a campaign, and every bit functions both in a strategy and thematic sense. 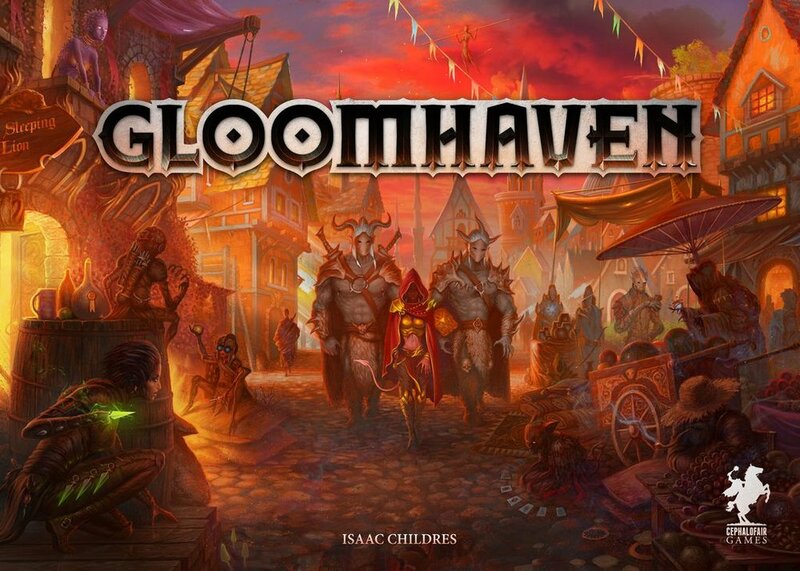 If you’re still unconvinced, head over to BGG, where Gloomhaven sits at #1. BJ Rozas (Board Game Gumbo): Gloomhaven is a cooperative, dungeon crawl with some unique mechanics and a deck management system that makes it stand out in a crowded field. Isaac Childress has built what feels like an immense, immersive world that is the closest game I’ve seen to an RPG-in-a-box experience. Here at the Gumbo, we started something we call “Campaign Fridays”, where we’ve gone through a number of longer games. I started out with the Gloomhaven group, and made it through three or four sessions before bowing out to Melissa (and she picked up the ball and ran with it!) But during my brief few weeks, I really enjoyed the sense of adventure and experience and leveling that hinted at a much larger world. Gloomhaven is not without its detractors in our group: for some, the combat is wonky, there are some definite strategies to handling encounters that feel a little unthematic, and in some cases, the story itself was weaker than expected (or so I’ve heard from the group). But in all in all, playing Gloomhaven feels like the 2.0 of all of the dungeon crawlers I’ve played thus far, and miles ahead of the D&D themed adventures that my family went through. Jamie Maltman (WDYPTW): I originally passed on Gloomhaven, avoiding the hype of yet another dungeon crawler with minis and a never-ending campaign. But when Isaac and Cephalofair launched their Euro game set in the same world, I read a bit of the backstory and was intrigued. This isn't your typical Tolkien or D&D inspired generic fantasy dungeon, but a whole new living world with fresh and intriguing races like the Inox Brute, Cragheart and Vermling. Drawn in by the lore, I stayed for the strategy - every level is a co-operative puzzle of how to optimize your your of two cards at a time that determine initiative, optimize your actions, trigger special powers for bonus experience, and help grab some loot while completing the objectives. All while managing your deck of actions unique to your character, which double as a sort of endurance you must conserve or you'll be forced to withdraw from the mission. The story is engaging as the world unfolds before you, encounter by encounter and in the branching path of adventures you choose that impact the world, and you get attached to your character and its development. I played a number of adventures with the same group, but campaign games are tough to fit into our lives with all of us having children under 10 and the difficult to sync schedules that entails. I'm going to try again to launch it with my wife two player, or might opt for playing it solo, which many have loved. Bill Corey Jr. (The Cubist): If you’re anything like me, you miss the days of being able to play in an awesome RPG campaign, and you remember how fun it was to explore a fantastic world where you got to be the hero of the story. It was amazing… but then the real world and its relentless schedule started making it harder and harder to plan effectively. Gloomhaven feels like the next best thing. It is essentially a roleplaying campaign in a box where no one has to be the gamemaster and all the writing and prep work are already done for you. It is an interesting blend of dungeon crawling hackfest and distinctly euro-feeling hand management mechanics. It is a complex system that provokes lots of rulebook questions and edge cases that can make it feel heavier and crunchier that it is. It is wildly ambitious, but that gigantic box contains an astounding amount of depth, both in terms of gameplay and storyline. Jamie Maltman (WDYPTW): War of the Ring is the ultimate epic tabletop implementation of the entire scope of the Lord of the Rings. From the cat and mouse game of the ring bearer sneaking across Middle Earth to attempt to destroy the Ring, to the political machinations of the Shadow player deploying Nazgul to incite dark forces to wage war against the Free Peoples, while heroes split off from the Fellowship to encourage those nations of dwarves, elves and Men to meet that fight, resulting in epic battles of armies of minis at every famous site from the books and movies. The action dice rolled every turn provide tense and varied options for both sides, but often with a cost - move more and expose the ring bearer, or spend more hunting and not be able to muster armies as quickly. The thematic event cards bring flavour and colour to battles or the board as a whole, and the heroes and Nazgul all have special powers to bring into play. Buckle up for hours of tense thematic Lord of the Rings glory, often coming down to a pivotal battle or the Ring Bearer limping over the finish line at Mount Doom. It's one of my favourite games, and I wish I could play it more often. Brandon Kempf (WDYPTW): Big, sprawling, epic, thematic -- all of those words can describe War of the Ring. I’ve only ever played this as a two-player game as the Free People, but that is enough for me. WotR is played out over a series of rounds, the Free People are trying to get the Ringbearer to Mount Doom, while the Shadow Armies are trying to stop them. This is all done with a roll of the dice, which tells you your actions you can take for the round, and some card play. WotR is one of those games where the more you know your factions, and the more you know the cards that you use to drive the action, the more the theme will come to the forefront and you can enjoy the tale unfolding in front of you. The Free People failing on the Precipice of Mount Doom has never felt so heartbreaking.